Divorce seems to be a word we hear too often in today’s day and age. With roughly 50 percent of marriages ending in divorce, it also happens all too often as well. There are a plethora of factors and causes that may lead you and your partner to choose to get a divorce. Then there are many other factors that can make the divorce process seem extremely difficult and convoluted requiring a divorce lawyer. At Peskind Law Firm, our lawyers have over 35 years of representing people in complicated divorce matters. 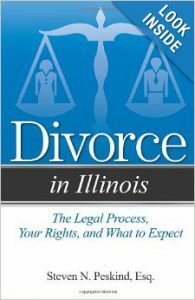 Our divorce lawyers regularly assist couples in St. Charles and the Chicago area to help make the process as smooth as possible. If you and your spouse are considering divorce or have questions pertaining to divorce matters contact one of our divorce lawyers at 630.444.0701 or click on the Contact Us link. There are more legal grounds and one not mentioned above, that seems to be the most common, is irreconcilable differences. There is more that goes into the last one, but that is why a divorce lawyer is needed to help you through this trying process. As previously stated, our divorce lawyers have over 35 years of experience representing individuals in this matter. Our lawyers stay up to date with the ever changing laws, including family law. We are a hard working team and what separates us from many law firms in St. Charles and the Chicago area, is we employ our own accountant. Our accountant works closely with our divorce lawyers to help plan out advantageous settlements for our clients. If you and your partner have exhausted all options at making your marriage work and you both have concluded that divorce is the most viable option, contact a divorce lawyer at Peskind Law Firm by calling us at 630.444.0701 to get the process rolling.